Vic Firth M160 Gifford Howarth Marimba Mallets are huge sounding low-end mallets. 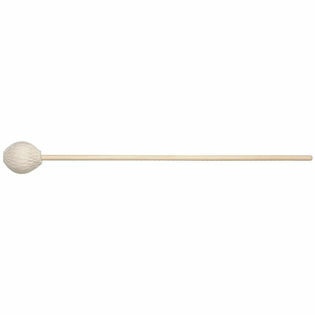 Great for cello suites or general use bass mallets. Produces a full overtone-rich bass sound. Very Soft. An active recitalist, clinician and master class teacher, Gifford Howarth designed his line of marimba mallets to create the highest quality of sound for the recital hall or within an ensemble. Each model allows the specific characteristics of each range to shine through - a deep full bass, a full sounding mid-range and a cutting high end. With long lasting yarn for durability and clear, unfinished birch shafts for a natural feel. Gifford Howarth demonstrating each Vic Firth Gifford Howarth Signature Marimba Mallet and explaining its purpose.